Ever wondered what a rip-off looked like? 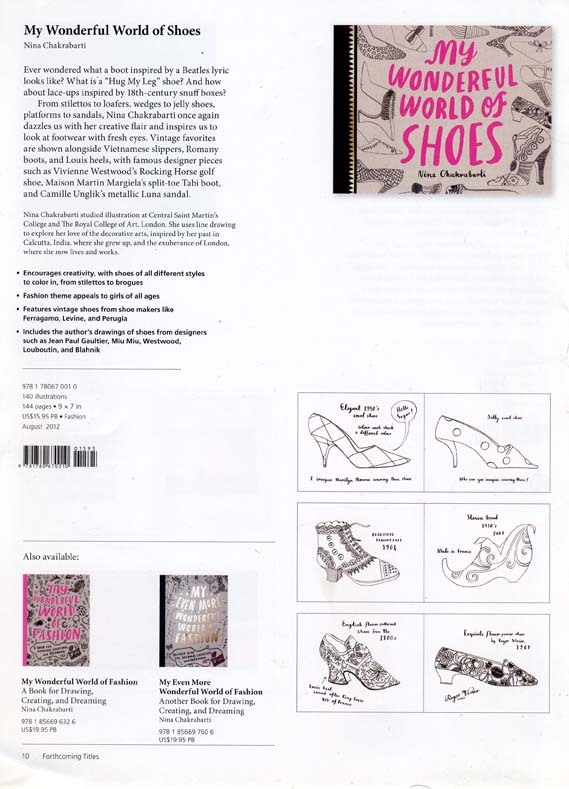 The latest catalogue from Laurence King Publishing of London includes a book called My Wonderful World of Shoes by Nina Chakrabarti whose illustrations bear an uncanny likeness to A Year in Shoes 2000calendar that I designed and lettered with illustrations by Pamela Kogen. (See the Calligraphy section of this website.) The only difference between the pages of this book and our calendar is the addition of short commentary. But the layout, the style of illustration (not as talented and minus color) and the style of calligraphy (poorly done) are all clearly derivative. Given the dubious track record of Laurence King Publishing regarding other graphic design titles in recent years, publishing a less-than-wonderful copycat book on shoes is only to be expected. A Year in Shoes 2000 by Pamela Kogen and Paul Shaw (New York: Stewart, Tabori and Chang, 2000). May. A Year in Hats 1995 by Pamela Kogen and Paul Shaw (self-published). September.